Carrie Derick, BA1890, MA1896, was McGill's first woman graduate. In 1912, she received a full professorship at McGill -- a first for a woman in Canada. 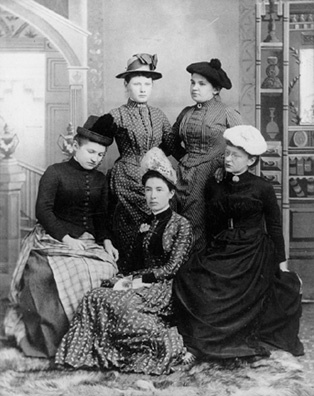 In honour of Smith, McGill’s female students were known for decades as “Donaldas.” Smith also funded the creation of the Royal Victoria College residential school for women in 1884. 1857: With Mary McCracken at its head, the McGill Normal School (the predecessor of today’s Faculty of Education) opens, offering the first English-language professional training for women in Montreal. 1888: McGill's first female students—Eliza Cross, Martha Murphy, Blanche Evans, Gracie Ritchie, Jane Palmer, Alice Murray, Georgina Hunter, Donalda McFee—graduate with Bachelor of Arts degrees. Ritchie was the first ever woman valedictorian. 1890: Maude Abbott earns a Bachelor’s degree from McGill. Her research into congenital heart disease caught the attention of Sir William Osler, who asked her to write a section on the subject for his System of Medicine. Abbott’s work culminated in her seminal Atlas of Congenital Cardiac Disease (1936), an essential resource for cardiac surgeons. 1897: Lucy E. Potter becomes the first woman to head a student publication. 1901: Harriet Brooks becomes the first woman to graduate from a Canadian university with a graduate degree in electromagnetism. She immediately goes to work at the Cavendish Laboratory in Cambridge, England, becoming Canada's first female nuclear physicist. Two years later, she returned to McGill to work with her grad-school mentor, Ernest Rutherford. Her observations and theories later proved essential to Rutherford’s Nobel-winning theory of radioactivity. In her obituary, Rutherford called Brooks “the most pre-eminent woman physicist in the department of radioactivity” next to Marie Curie. 1910: McGill awards Maude Abbott an honorary medical degree—eight years before the University finally admits women to the Faculty of Medicine—and a lectureship in the Department of Pathology. 1910: Annie Macleod (Chemistry) becomes the first woman to earn a McGill PhD. 1912: Carrie Derick becomes the first woman in Canada to be named full university professor. A pioneering geneticist, she created the first course on genetics and evolution and gained renown as a botanist and social reformer. The previous year, Derrick became the first woman listed in the presitigious "American Men of Science" listing. 1914: Annie MacDonald Langstaff becomes Quebec’s first female law graduate. 1917: For the first time, women outnumber men in the Faculty of Arts. 1919: McGill defeats Queen's University in a basketball game, the first intercollegiate sporting event between women's teams in Canada. 1922: Five women graduate from McGill’s Faculty of Medicine. One of them, Dr. Jessie Boyd Scriver, would go on to become Montreal’s first female pediatrician. 1936: Maude Abbott becomes the first woman to be admitted to McGill's Faculty Club.